I'm a San Joser and i will be PISSED off if the Peninsula route's canceled because of those stupid soccer moms! if they lie down on the tracks can we run over them? As for the tunnel and giving them a "park avenue" this is exactly why, if they want a tunnel they should pay for it because they will be getting a huge benefit in the form of increased real estate values, undergrounding of all rail traffic, a new park, plus easy access to the system. I benefit that other cities won't get. No on is gonna pay for all that - unless its PA.
We've had an extensive discussion on the El Palo Alto and the area north and south of it over on the Caltrain-HSR Compatibility Blog. Bottom line: a raised berm in Menlo Park also means an elevated solution in Palo Alto, even though there are already perfectly good underpasses at University Avenue, Embarcadero and Oregon Expressway. Any covered trench/tunnel system through Palo Alto would probably begin just north of Oregon Expressway. In the course of the complex construction project, Embarcadero would be brought back up to grade. The solution would switch to tunnels north of Embarcadero to dive under University. They would need to accomodate four tracks and an underground station below the existing one. The tree would probably not be affected, since the two additional tracks would be to the west of the existing ones. The old bridge across San Francisquito creek would be demolished but not replaced, as all trains would pass under it. Gradient and grade crossing considerations mean that trains might have to stay underground through the Redwood City station. Given the length of the tunnel/covered trench system, UPRR might have to electrify its Milpitas line so it could switch to electric locomotives for the peninsula milk runs. They're not going to pay for that themselves. The peninsula would gain a 6-mile stretch of land approx 100 ft wide, which could be used for a linear park. It would come with one very large price tag. A much less disruptive and cheaper solution is to keep the alignment at grade, construct deep underpasses at primary cross roads and make do with hardened grade crossings at the secondary ones. Sound fences could be constructed in suburban settings to mitigate visual and noise impacts and, double as the foundation for wire mesh security fences. The side facing residential properties can be landscaped with climbing plants. Sound mitigation is more difficult for elevated structures, which are also inherently more susceptible to earthquake damage. FRA requires "impenetrable barriers" for sections with a speed rating of between 110 and 125mph, but not full grade separation. At the option of the affected communities - not CHSRA !!! - selected grade crossings could in theory be retained. In practice, that would mean sturdy four-quadrant sliding gates rather than flimsier booms that rotate into place. 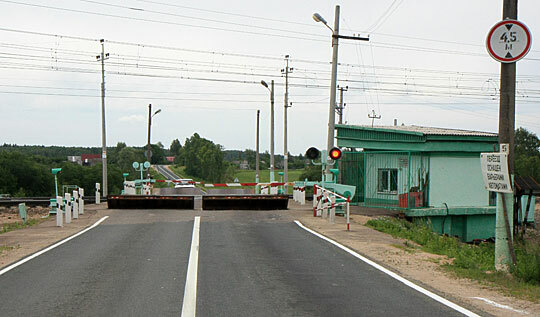 In addition, the approaches to the crossing could feature a narrow, tall curb in the median and one-way tire slasher strips at some distance from the gates. Speed bumps would discourage motorists from trying to sneak through just as the gates were closing. Flashing lights would indicate an approaching train, but there would be no bells or horns (FRA quiet zone). At 10-12 trains per hour total each way - a reasonable upper bound for rush hour operations operations in the first years of integrated train operations - such grade crossings would be open around ~60% of the time. At 20 tph, that would drop to ~30%, but that level of traffic is not expected before 2030 at the earliest. Train operators may anyhow want to use longer and/or bi-level trains to keep tph count down and ease rail traffic management. Nevertheless, it might make sense to operate the barriers lazily, i.e. once they're closed they stay that way until a waiting motor vehicle is detected (via button to request passage or, an induction loop embedded in the road). If and when train per hour count exceeds a certain threshold, it might make sense to close the crossing altogether, but only at peak times. This type of hardened grade crossing solution could be complemented by a pedestrian overpass with ramps suitable for wheelchair users, to avoid excessive wear and tear on the barriers. Bikes would need to be walked across. If all of this sounds expensive, it is - relative to a regular grade crossing. However, you could build literally dozens of these for the cost of running one mile of tunnel through the mid-peninsula. Clem commented that Menlo Park has already conducted a local environmental impact study considering various options including keeping the tracks at grade. Considering trains aren't rollercoasters, it's important that neighboring cities stick their heads together and decide on a solution that can actually be implemented without breaking the bank. Btw: if the tracks remain at grade and CHSRA decides to build the mid-peninsula station at Palo Alto, the station building could enclose the tracks to implement noise mitigation and provide a basis for a green roof. Since HSR trains can be up to 400m (1320') long, it might make sense to convert El Camino Park just north of the existing small station into a bus terminal. There is already a large parking lot across the street at Stanford shopping center, capacity could be increased by adding a second level. A pedestrian bridge across El Camino Real would provide safe passage and a place to attach signage. The park would be restored as a green roof on top of the bus terminal. Here's a good example, from Russia, of what I would consider a good impenetrable barrier, at least in terms of keeping cars off the tracks. I know people here believe that HSR will stand up to absurd nimby interests in the courts due to the tremendous public benefit and need of the project. But I'm going to tell you, that's absolutely not enough. These NIMBYs are the worst, most tenacious kind: rich ones with way too much free time. CAHSR needs to hire a huge team of good, expensive lawyers, and quick. Now that the opposition is uniting, these folks will stop at absolutely nothing to stop the HSR. The NIMBYs lawyers will exploit every possible loophole and omission and technicality leaving no avenue unexplored and no stone unturned. CAHSR had better be right there with them in the legal battle or else they'll wind up with a judge ORDERING them to build the line in a tunnel. Don't just sit there and defend their position; go AFTER the bastards. Debunk them. Expose them for what they are, self centered jerks who think that billions of public dollars should be used to boost their property values, when they're the ones moved in next to a railroad track in the first place. I am sure the lawyers are now smelling blood. Maybe they are already circling round and ready to take their bite. A grade crossing of any kind is not an impenatrable barrier. If you knew even the first thing about the peninsula cities you're talking about mangling, you'd know that death on the tracks come from people walking on to them and standing on the tracks. Here's a news flash, one way tire slasher strips don't keep people out. If you' open gates, its not impenatrable. And here's another news flash for you. There are thousand of kids with bikes crossing at those 'secondary' crossings every day. In fact east meadow which has been drawn OUT of the Final Program EIR/EIS is the main artery that connects east and west in south Palo Alto to a 1000+ middle school, a 500 student elmentary school, South Palo Alto's Firestation, Mitchell Park (Including the Community Center and the city Library which got just approved for a MAJOR bond for rennovation by all of Palo Alto. Its neighborhoods you're talking about here. Its not about cars and its not about tire slashers to keep people from crossing the effin street. Get educated. Until a waiting vehicle is detected... Wow. You're post just gets better and better. You really should probably get educated about these town(s) before you mouth off with these brilliant ideas. There are hundreds of cars crossing at all these crossing hourly. There is ALWAYS a line of cars at red lights and a steady stream crossing at greens. You're talking about creating sheer traffic gridlock. And again, if you bothered to educate yourself with the areas you'd know that the scale of the crossing areas (including the surrounding homes that are on the cross streets, and streets running parallel with the tracks, what you're talking about pedestrian overpasses etc - totally moronic. You'd have overpasses that angle up at such a severe angle (and such a fabulous height, given that the electrical overhead), that you'd either have to install mountain climbing equipment or elevators. And keep right on going with your brilliant ideas like "converting El Camino Park into a bus terminal". You can be certain that Palo Alto will fight any bit of added parking or bus terminal or street widening, or any other bit of transportation enlargement that encroaches on walking, biking, homes, parks or businesses. (You might be interested to know that Palo Alto's other issues right now include community up in arms because they are out of playing fields and the city has moved to charging $50/hr for use of playing fields. You have no friggen concept of the community SYSTEMS involved, you demonstrate over and over and over again that all you really give a damn about is getting this train rammed through. Hardened positions. YOU BETTER BELIVE IT! You really have a keen sense of how to flame this up. You're doing us a huge favor. I'll post a link to your great ideas immediately to the online forum Palo Alto. @anon Thats why the best solution is the raised berm with full grade separation. @anon post this.... Dear residents of Palo Alto and MEnlo park. It may come as a surprise to you to find out the most californians are sick and tried of wealthy nimby's telling everyone what they can and can't do. You are no more special than any one else in this state and in fact this prop 1a even passed in your own cities which means that this uproar is about a group of folks who think they are part of a protected, "special consideration" class who are not subject to the things that the rest of are subject to, such as progress, development, and some of the less than perfect inconveniences of urban live. I hate to pop your collective bubble, but you do not live in Yosemite National Park. You live in the San Francisco Bay area with 7 million other people... people to whom you apparently think you are superior to. You're not. Your second to last sentence summed up my sentiment to a tee: HSR will be built on the peninsula and will use the current Caltrain corridor!! End of story P.A., Menlo NIMBY's! Speaking of both communities, just look at a map of the Bay Area and see how small of a footprint they have on the HSR/Caltrain corridor. Are they, as Owen E alluded to, really going to have a final say over San Francisco, San Jose, other peninsula communities that supported HSR, and the state as a whole? I think not! Make HSR better for their communities? : yes. Stop HSR completely? : GET THE HELL OUT OF OUR WAY! just in case you've never seen a high pedestrian overpass suitable for wheelchair users: the ramps run parallel to the tracks! Yes, they'd be long but so what. And of course the bridge over the tracks has high fences to deter suicidal maniacs. Also, any modification to El Camino park would be completely moot if Palo Alto decides it doesn't want the mid-peninsula HSR station + connecting transit and TOD after all. That's fine, Redwood City would love to have all of that. Also, with appropriate architecture, a green roof is a publicly accessible park, baseball diamond and all. Palo Alto would lose use of the existing one, but it would be replaced after construction was completed. Think in three dimensions please. And oh by the way, I used to live in Palo Alto about a decade ago. If the citizens of Palo Alto and Menlo Park decide they want to have those grade separations after all, great, CHSRA will build them for you. It's just that its budget permits only the least expensive option, i.e. an embankment with shallow underpasses for the remaining grade crossings. If you want something fancier/prettier, you need to fund the difference yourselves, just like Berkeley did for BART. All we're trying to do here is give you guys additional options. All you're trying to do is bite everyone's head off. Everyone should realize that the people of Palo Alto,Atherton and Menlo Park are not just thinking of themselves, quite the contrary. All of us will have to pay the billions of dollars that this project will cost. Caltrain is being electrified at a cost of $608 million dlls.If it isn't slowed down buy the HSR issue it will be running electrified trains by 2015,reducing pollution by 90% (from Diesel engines) This cost is Significantly less than the $4.2 billion for 50 miles of HSR, serving the same corridor and it will take 50 minutes vs 30 minutes. Why pay the 4.2 billion dlls for those 20 minutes???? I agree with the Anonymous re: 4.2 billion dollars for 20 minutes. I'm pro HSR, as long as we don't build redundant systems - but are we being wasteful? Why not have HSR connect to the Caltrain that is going to be electrified anyway? Is all that money really worth it for the last 50 miles to shave off 20 minutes (assuming the calculations are correct)? Also, I think we can all agree that the cost projections are likely to be higher than we can possibly imagine at this point - it is just the nature of these huge projects (the Big Dig is a great example). Is this really the only way? I would love to see a well written explanation (without insults or NIMBY accusations) that really explains why this is the only way? Rafael - I'd love it if you could take a stab at it. roughly speaking, the Bay Area is a big horsehoe-shaped MSA, with CC adding a triangle. Technically, the North Bay counties are also part of the Bay Area but they are not (yet) well connected to the rest by public transportation. For HSR to capture sufficient ridership, it must serve the whole Bay Area. Initial plans called for West Oakland to be served as well, but were canceled since BART puts it close to SF. Running the trains only to Oakland only would have served a larger population, but it would have been just as expensive to take trains into the heart of that city as in SF. The latter city was willing to put up a big chunk of change for the northern terminus in the context of the SFTT project. SFO, the region's major airport, is also on the peninsula side. Taking a Caltrain baby bullet to SJ Diridon and transfering to HSR there was considered but rejected. It's not just that the trains take 20 minutes longer, passengers lose another 10-20 minutes changing trains (depending on time of day and day of week). It's bad enough that East Bay residents will have to use BART to catch HSR, but SJ insisted on its extension. That will usurp a critical section of ROW for a spur up to Oakland between hwy 262 and Niles, so unless UPRR is willing to sell additional land, there simply isn't anywhere to run HSR tracks between SJ and Fremont. Pretty much the only option would be additional tracks along the Alviso alignment or, a new, tall dual-track Dumbarton rail bridge. Either way, construction would impact the Don Edwards Wildlife Refuge. Bottom line: HSR is going up the peninsula because without direct service to both SJ and SF, the entire project would not be viable. Voters endorsed that logic on Nov 4, even if many hated the idea of the preferred routing through Pacheco Pass. It's time you accepted the verdict of the electorate. About the lawsuit, you can find the court documents at the sacramento county court's website. The case number is 34-2008-80000022 (it's listed incorrectly on the CAHSR's online agendas). The most recent filing is from CAHSR correcting some basic errors with the draft EIR, which I'm guessing is what the opening statements were about. Looking at the filing though, does anyone know anything about the other petitioners? There's the two cities (Menlo Park and Atherton), but also BAYRAIL ALLIANCE, CALIFORNIA RAIL FOUNDATION, PLANNING AND CONSERVATION LEAGUE, and TRANSPORTATION SOLUTIONS DEFENSE AND EDUCATION FUND. Lots of talk about the voters of California "having spoken". Most propositions, including the bond measures, are so vague and the voters so overwhelmed with the ballots...do you really think the however many millions who voted all did their homework and all understand this project? C'mon. The pro-bond arguments always emphasize "no new taxes" but conveniently avoid the financial reality that we and future generations pay to repay the bonds. It is not free. But it is sold as if it is free. If you skim the voter pamphlet the night before you vote, well, hey 1A sounds good! So...ok, I'll vote yes. OK, I know, this is history now. The bond passed. But don't go on about the voters having spoken. This was a sell job, and the backers won because there was no significant opposition, not on the merits of the HSR. "just because your upset it passed and is going to run up that 120 year old railroad is no excuse that people did not really what it." What it? Sorry, I don't understand your point, perhaps you had some typos or didn't type it quite right. So are you saying that people in fact did not really what (want??) it? Typo...people WANT IT maby people by the tracks dont but 63percent voted yes in these cities and they knew what they were doing! why is BayRail Alliance on that list? I thought they supported HSR? Because they wanted it to go thru the East Bay...they already have all the intercity rail over there. "OK, I know, this is history now. The bond passed. But don't go on about the voters having spoken. This was a sell job, and the backers won because there was no significant opposition, not on the merits of the HSR." Yeah, the voters of California are retarded and the only people that can save the state are in Menlo Park. There is no denying that the thing will cost gobs of money. I think there will be cost overruns. I hope there aren't delays. I don't care if zero private funding is found. I think a federally funded national HSR network is sorely needed. Maybe voters are sick and tired of our government investing in Iraq and want to see some goddamn investment here. Maybe voters are fed up with driving and want to invest in mass transit of all speeds. God forbid we spend billions on rail. Do you know what the initial cost projections for the Interstate Highway System were? It was $25 billion over 12 years. It ended up costing $114 billion ($425 billion in 2006 dollars) and took 35 years to complete. Because construction costs have outpaced the rate of inflation, that figure would be even higher today. If we take on a project of that magnitude but replace the word highway with rail, we would not only create jobs in a long-term recession but also end up with a viable alternative to the personal automobile. WOWWWWW! Now that's what I call reaching! Nothing more to say about that post. While many hated the choice of Pacheco Pass, many (including myself) loved it! Please people, let's not let the "smart voters" of Menlo and P.A. somehow resurrect the whole Pacheco/Altamont debate. Their position is wrong through and through and isn't justified one bit. Imagine telling Gavin Newsom and the city of SF that they aren't getting HSR service because the small hamlets of Menlo Park, Atherton and P.A. said so. Why is there so much anger over the possibility of a trench/tunnel in Palo Alto? CHSR has long shown illustrations on their web site of a trench type grade separation on their web site in a not particularly scenic part of Burbank, why shouldn't this at least be considered on the peninsula? 10 years ago the Alameda corridor was built in LA for a cool 2.4 billion, half of which is in a semi-covered trench. (and this is not through some rich NIMBY-prone neighborhood by any means). You don't need to use deep-bore construction if you're building in the existing right of way, cut and cover (which costs only a little more than a trench) is perfectly fine. Now, I'd imagine in the end that the various municipalities would wind up paying for at least part of it, but since it's difficult to argue that from a standpoint of aesthetics, quality of life, and safety, that a tunnel or trench is the best option, I don't understand the hostility to the idea. cross traffic in Burbank is much heavier than in Menlo Park. Think Oregon Expressway rather than Oak Grove Ave. In addition, Burbank is on the BNSF line north out of LA, so there are a lot more mile-long freight trains running through there than in Menlo Park. Btw, the Alameda Corridor project in LA eliminated several hundred grade crossings along the old rights of way, which used to be closed very frequently because of all of the freight trains into and out of the LA and LB harbors - each of which handles much more freight than Oakland. One of these legacy ROWs was sold to LA Metro in the context of the project and is now the subject of a transit planning study for the Harbor Subdivision Transit Corridor that would link LA Union Station to LAX and Long Beach TT. In other words, those $2.4 billion for the Alameda corridor delivered hugely more bang for the buck for the buck than a trench through Menlo Park ever would. In addition, the three-track corridor generates trackage fees that are gradually reimbursing the taxpayer. The expected operating profits from HSR will be needed to fund the spurs to SD and Sac, then possibly an overlay through Altamont later on. Note that HSR through the peninsula means (mostly) quad tracks, primarily because of the wide disparity in the speeds of the various trains. If you want a four-track trench, it can be done but the value-add is primarily to the local communities, so they are the ones that have to fund the difference. Cp. BART through Berkeley. Note also that the San Francisquito creek and storm drains would make any shallow underground alignment in the mid-peninsula very challenging to construct. Not sure about where the sewer mains run. I'm sure the engineers could figure out solutions, but it would be expensive. What I find aggravating is that these people will benefit from HSR. Where I live I will never benefit from it and will probably never be able to use it. Never-the-less I will be helping to pay for it but I have no problem with that as it will be helping millions, creating jobs and is more environmentally friendly. So we have these people who will be benefiting from it but want the rest of us to fork over even more money so they can get some park. What they want is the benefits of HSR but with none of the sacrifice. Get over yourself people, you are not that important. I'm a HSR backer and I despise NIMBYism. But the lack of sensitivity on display here is just mind-boggling. Once again, Rafael's insistence that a "landscaped viaduct" will have absolutely no impact on the community, and his casual suggestion of destroying the well-situated El Camino Park for a bus terminal, plays right into the hands of our opponents by being completely oblivious to what makes great places function. Rafael, please go back and brush up your Jacobs before running your mouth about destroying community assets. Also, take a look across the street at the ocean of asphalt there before suggesting greenfield development. As for viaduct vs. tunnel, my hometown of Philadelphia has enough experiences with viaducts to know that tunnels are sometimes just a necessary expense for stitching together a walkable, transit-oriented community; the Pennsylvania Railroad's infamous "Chinese Wall" cut Center City West in half for 70 years before it was torn down and replaced by a tunnel. After it was gone, the neighborhood flourished, with office buildings rising in its footprint along what is now JFK Boulevard. The railroad had been a barrier between the city and itself just as much as I-95 was and is a barrier between the city and the Delaware River waterfront. That being said, I agree that it is the local communities' responsibility to come up with most of the additional cost of a tunnel, if they want one. It won't be cheap, and the limited funds available have too many other priorities, like Tehachapi Pass, Sacramento, and San Diego. (Even using HSRA funds for SFTT is a higher priority for the system.) But I would be very much in favor of offering some amount of matching funds, between 15% and 33% of the added cost of tunneling over elevation, if Palo Alto is really going to be the mid-Peninsula hub it is planned to be. Let's at least be accommodating of people's legitimate concerns; if they are just being NIMBY for NIMBY's sake and reject the offer, then we can proceed accordingly, but if HSR is to be built, then its supporters must be the one's acting in good faith. We cannot afford to be the next coming of Robert Moses. I am absolutely not opposed to a trench or a tunnel. However, I do have something against the way the folks from Palo Alto and Menlo Park are going about getting one. They are taking this to court, I would conjecture, in order to force CAHSR to build the line in a tunnel WITHOUT the municipalities having to make up the difference. If they were willing to put up the difference in construction costs, as they should, then there would be no dispute and they would be talking to the HSR authority rather than litigating. Right? The thing is, if Menlo Park and Palo Alto win their cases, then every other town along the route will take it to court too and win the same judgement by precedent. This will be so expensive that it will kill the entire HSR project outright. And they probably won't care. This is what bugs me. It seems that these folks want to get CAHSR to bury a 120 year old rail line for them. That, to me, seems like they're trying to get $BILLIONS from federal and state government sources just to give them a boost in property values. FYI the Alameda Corridor would have cost a LOT more if it HAD been built in a residential neighborhood with heavy opposition. Part of the reason why it was doable in the first place is that it mostly goes through industrial areas, and the residential areas it does go through have some of the lowest property values in the region. Had there been highly organized opposition who hired expensive lawyers to win unnecessary property-value-boosting concessions such as making it a tunnel instead of an open trench, and covering the entire corridor with flower gardens, trees, and parks, the entire corridor would not have been possible at all. The "WALL" commnet isjust the lastest scare tactic being used.actually I think the Nimbys used Berlin Wall to really paint a horror thought. Once again there are already theses kind of grades along the route and they are not some ugly giant things..there very well designed and hace style and landscaping around the underpasses. CComMack, nobody here is talking about becoming the next Robert Moses. My posts on the Peninsula subject have *consistently* argued for the residents of Palo Alto to constructively find a way to ensure that HSR meets their community's needs without undermining the overall project. There is plenty of room for such an accommodation to be made. What I am instead seeing is a hardening of positions and outright HSR denial being couched in "won't someone save our community?" nonsense. If the concern is about concrete barriers vs grade crossings vs tunnels that's a totally sensible subject for discussion. But Palo Alto is trending toward a desire to kill the project outright. That is simply NOT going to happen. As I said in the post, whether or not HSR gets built along the Caltrain corridor isn't up for discussion. That is a done deal. If Palo Alto wants to make HSR work for their community - a goal we ALL want - then they need to realize that HSR is happening. The NIMBYs need to stop acting as if they can kill the project, and instead start thinking constructively about this. And I suspect Owen E is right that these kind of NIMBYs won't give up. But I believe it's important to offer the olive branch first. Another problem is the "Done deal" rhetoric. HSR isn't a done deal. Cancellations happen, even for projects that have gotten final approval, for example the aforementioned Lower Manhattan Expressway. For community outreach to work, the government authority needs to treat it as a two-way dialog, rather than as a way to defend a foregone conclusion and ask the community to "find a way to make it work." You should note that there's nothing in the wording of 1A that's inconsistent with running HSR trains at high speed to San Jose and then at low speed to San Francisco. Both the TGV and the KTX were constructed in stages: the TGV was initially low-speed for one third of the way from Paris to Lyon, and the KTX is low-speed from Daegu to Busan. FRA regulations permitting, there's nothing wrong with having the high-speed line run only to San Jose - it would provide an LA-SF run time of about 3:00-3:30, which is competitive with air. The low speed through the Peninsula should then spur the demand for increasing the maximum operating speed. There have been movements for building unfinished things. For instance, in Toronto, after Jane Jacobs got a highway canceled even after the land for it had been cleared and graded, suburban interests got the highway project reinstated and completed. The highways that were never built are those that Jacobs stopped before any land was cleared for them. The lesson here isn't to call people in Palo Alto NIMBYs, but to create conditions that will ensure future support for completing the HSR line as planned. pThey're correcting mistakes in the EIR/EIS? Well, that's interesting. Empire, Orange County, and San Diego CONSISTENT WITH THE AUTHORITY'S CERTIFIED ENVIRONEMENTAL IMPACT REPORTS OF NOVEMBER 2005 AND JULY 9, 2008." Voter's mislead by the authority? Well that's too bad. Because once they are successful in invalidating the "Final Program EIR/EIS" the next next logical conclusion is that voters were misled and measure 1A is illegal. Here's the problem with that approach (of basing the public vote on a half-assed Program EIR/EIS) If the actual realities of the Project level EIR/EIS's, don't align with the Program EIR/EIS assumptions, it opens up quite a can of legal worms. The concept of 'extending the olive branch' has interesting connotations (ie: negotiations). Perhaps CHSRAs greatest miscalculation yet will prove to be the digging in of heels around demanding the Caltrain ROW, or even Pacheco Pass, while failing to factor in the great costs to the big scheme of CHSRA progress (in terms of time, and negative publicity, and extent of community demands, much more environmental impact studies, more extensive than expected mitigations, more expensive than hoped for designs, more expensive and extensive emminent domain costs, more legal fees, etc..
Its really too bad that CHSRA has taken the position that the Caltrain route is a done deal 'because I said so'. It could have been alot easier to make CHSR a reality. But if they wanted a fight, I guess they came to the right place. (A) Sacramento to Stockton to Fresno. (B) San Francisco Transbay Terminal to San Jose to Fresno. (C) Oakland to San Jose. (E) Los Angeles Union Station to Riverside to San Diego. (F) Los Angeles Union Station to Anaheim to Irvine. as usual, the devil is in the details. AB3034 explictly specifies an aggressive time for non-stop service from SF to LA. I can't remember the exact number off the top of my head, I believe it was very close to 2:40. You cannot achieve that without running at up to 125mph in the SF peninsula. For both financial (cp. new east span of Bay Bridge) and environmental reasons (Don Edwards National Wildlife Refuge), there was massive opposition to constructing a brand-new dual-track Dumbarton rail bridge tall enough to eliminate the bridges for the two shipping lanes and strong enough to meet modern seismic code. That would leave routing the trains around the South Bay, which would also means running HSR tracks through Palo Alto. However, the target time could not be achieved if trains had to reverse direction at San Jose Diridon before heading out via Altamont Pass. Siting the HSR station at Santa Clara instead would have brought the non-stop line haul time to within about 8 minutes of the target. San Jose's vociferous objections to passing Diridon station by would no longer carry quite as much weight now that SC county voters have approved an additional sales tax hike so the BART extension to Santa Clara can actually be built. Unfortunately, there's a major snag: that same BART extension will use up the only available ROW between hwy 262 and Niles - that's why SC county purchased the defunct WPML line when UPRR decided to sell it. It's only a short section, but HSR trains cannot fly. Stacking HSR tracks on top of those for BART - let alone tunneling underneath them - would be extremely difficult, if only because of the close proximity of the active Hayward fault. UPRR is unlikely to cede any of its remaining ROW, because its Fremont yard is still very much in use and there's only room for a single track between Niles and Fremont Irvington. Ergo: revisiting the whole Altamont vs. Pacheco Pass can of worms is not even feasible at this point - much to my chagrin, btw. There is scope for enhanced ACE service, especially if and when the existing single-track Dumbarton bridge is repaired, but there won't be any high speed trains running through Altamont Pass - or even just up to Oakland - unless UPRR decides to pick up sticks first. a) A landscaped viaduct is not at all the same thing as a landscaped sound fence. b) Iff Palo Alto is chosen as the location of the mid-peninsula HSR station, there will be a requirement for some additional parking as well as enhanced transit services. Adding a second story to the lots across El Camino Real would be an obvious and preferable strategy, but they are owned by Stanford Shopping Center, which may not be amenable to it. In any case, if any part of El Camino Park were considered for either a bus terminal or parking, the lost park area would be replaced via a publicly accessible green roof. That may be a novel concept to you, but it is also part of e.g. the design of the new transbay terminal center in SF. The legal details aside, California voters - including 65% of San Mateo County - voted for HSR. Whether or not the route definition is legally fungible, voters approved a high speed train following a route from SF to LA via Pacheco Pass. It would strike me as bad faith, and would undermine HSR support around the state, if either of those were changed merely to suit NIMBYs. I believe it is extremely important to hold a firm line against this small group of HSR deniers - they cannot be allowed to question or change the basic aspects of the project voters approved. I'm all for those communities working out a mutually beneficial solution with the CHSRA on how to build HSR. But those communities have no right to question whether or not the project will happen. The comparisons to NYC in the 1950s are simply absurd. The railroad predates Palo Alto - not the other way around. This is not a case of blasting a completely new piece of infrastructure through a community, but an upgrade of an existing facility. The more accurate comparison is to widening a freeway, even though that too has its flaws and imperfections. Let's be very clear about what's happening here. Some HSR deniers in Palo Alto see a chance to use community concern about how HSR will impact their town to try and change the basics of the project. They have no right to do this, are acting in bad faith by doing so, and will do nothing to help their community with these tactics. Robert, the analogy to freeway widening is apt. Moses told more or less the same thing about widening to the communities - it's a done deal, but I'd like to reach a solution with you. Perhaps a darker analogy though would be projects putting up elevated freeways over arterial roads. This was a major infrastructure upgrade from the point of view of suburban commuters, who now enjoyed greater road capacity. From the point of view of the local neighborhood, it was a disaster, even without destroying homes. Even when traffic was grade-separated, the existence of concrete columns instead of trees and the noise of car traffic destroyed the street and split the neighborhood in two. Palo Alto has no right to tell SF not to get its trains to LA, but neither do SF and LA have the right to dictate railway land use to Palo Alto. Wow, I am glad I dod not invest any time and energy into this blog thread until now. It seems to me that Menlo Park and Atherton nimby's think they have a case. They do not. Voters approved the HSR system with specific goals and objectives in place. Rafael corectly pointed those out. And in my humble opinion, Menlo Park or Atherton, individually or together, do not have the political capital to affect change. Throw in Palo Alto and every single jusridiction between San Francisco and San Jose... and they still do not. And imo the hypothetical scenario of the Environmental work being tossed in Sacramento is extremely remote. If anything, maybe an element or two of the environmental work pertaining to the CEQA could be questioned or deemed incorrect in some way; however, the work wouldn't be tossed... maybe requested to be amended. It certainly would not invalidate the Prop 1A vote. The bottom-line, and Robert is spot on on this, is that HSR is coming through San Mateo County. Local jurisdictions having concerns should work WITH the CHSRA to address their concerns as much as practical. What is not addressed, they'll need to come up with solutions on their own and out of their own pocketbook. Let us not also forget, the railroad right-of-way was there first and per Federal (and maybe state) has certain rights and abilities providing a lot of leeway in doing what they see is needed to run operations. Brandon, sure they do. Silicon Valley is a productive area, one that would feature prominently in a hypothetical book entitled The Death of Life of Great American Suburbs. You can argue that an elevated rail line through its cities will not materially harm it; however, just saying that there has existed an at-grade rail line there for 120 years is not enough. You can also argue that being rich, Silicon Valley can be guilted into putting its own money into undergrounding the line. But that's less trivial than you think - the Big Dig was paid by the city of Boston in general; the replacement of els by subways in New York was paid by the city government rather than the affected neighborhoods. I'm not saying Palo Alto shouldn't pay, just that you need to make a stronger argument than you're currently making.